Fancy an exotic yet demure look for for bridal engagement party? Indian Muslim shalwar kameez (tunic and pant outfit) is a great pink. Indian Muslim designs are often in keeping with Islamic style of dressing for Muslims. The Indian Muslim shalwar kameez designs are often with long sleeves tunic and long pants, paired with a long scarf, called a dupatta. 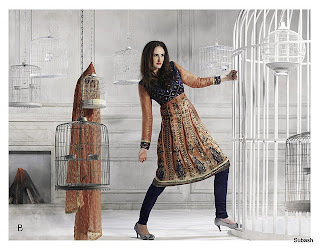 Here are some fantastic looks to get you inspired in designing your own Indian Muslim styled Bridal Engagement Dress. The selected designs are perfect for a Winter Wedding. Colors are from the cool color palette. Nice read, thanks for shared.but why not hav more the picture?